Amid ongoing debate over the minimum wage hike, the Ministry of Employment and Labor on Monday laid out a rough draft of the revised minimum wage calculation method, which contains details about the composition of the committees in charge of deciding the annual hourly minimum wage. But the changes face escalating opposition from labor groups, which argue that the new process is less likely to reflect their position. “The minimum wage decision-making process has remained the same since 1988, while Korea’s economic and employment conditions have changed significantly. 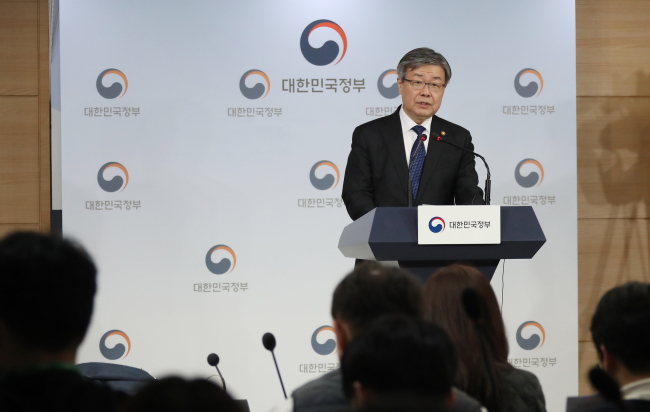 I believe it is time to make changes to the decision-making system, which stresses differences between management and labor,” said Labor Minister Lee Jae-gap at a press briefing at the government complex in Seoul. Lee spoke of the importance of the minimum wage, saying it acts as a standard for various social security payments. In late December, the government rolled out the revised Enforcement Decree of the Minimum Wage Act, which involved increasing the minimum wage to 8,350 won ($7.50) per hour, up 10.9 percent from 7,530 won, and stipulating paid holiday hours. Another key change is dividing the role of the Minimum Wage Commission between two committees -- one consisting of policy experts and the other of actual market players across various sectors -- “for objective and fair decision-making,” the government said. The 27-member Minimum Wage Commission -- representing labor, management and the public interest -- have decided the minimum wage for 30 years, since Korea adopted the minimum wage policy in 1988. Now the committee of experts is to decide on a range of changes to the minimum wage, while the latter will finalize a figure within the approved scope. According to the rough draft, the committee of policy experts will consist of nine professionals recommended by labor and management organizations. Based on a yearlong analysis of statistics and on-site monitoring, the committee will set the range of minimum wage fluctuations for the coming year, the government said. The committee of actual market players will involve 15 or 21 people -- young workers, women, part-time workers and workers in small and medium-sized enterprises, among others -- representing labor, management and the public interest. The ministry emphasized that to settle controversy surrounding the selection of delegates representing the public interest, it is reviewing transferring partial recommendation rights to the National Assembly or to labor and management organizations. Previously, the government had recommended the delegates representing the public interest. The Federation of Korean Trade Unions and Korean Confederation of Trade Unions are slated to hold a workshop this week to put together a counterplan in response to the latest draft. “Under the plan, the government would decide the minimum wage in disregard of those directly involved,” Lee added. The government is expected to finalize a revised calculation method for the legal minimum wage this month.